It was announced in February that the restoration of the Dzong would start this year to celebrate the Royal Birth and 400 years of Zhabdrung’s arrival in Bhutan. The 17th century Dzong in Tsento Gewog was built during the time of Zhabdrung Ngawang Namgyel, as a symbol of victory over external invasions. 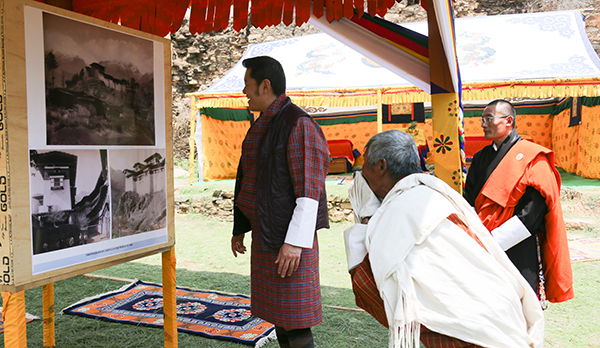 His Majesty was accompanied by the Prime Minister, the home and education ministers and other senior officials. The Dzong was built in 1649 by Tenzin Drukdra under the command of Zhabdrung Ngawang Namgyel. In 1951, a fire caused major damages to the Dzong. Kaley, the dzong’s caretaker, Kaley was only 10 years old when the fire incident happened. He said although the utse of the dzong was restored after the fire, time has taken its toll on the fortress of victory. As of now, an archaeological survey of the Dzong and soil testing of the grounds are being carried out. It is expected to finish in a few months time, after which, restoration works on the structures will start.